Wye Valley Canoes Outdoor Pursuits CentreOur small team of well qualified instructors can offer you courses in both Canadian and Kayaks from novice to aspiring expert. We can put you through your star awards and award the Badge and Certificate to successful candidates. If you only want to laze away a sunny day on the River Wye, paddle along one of Britain's most beautiful rivers. The river sweeps through a National Nature Reserve near Glasbury. Tremendous views of the Black Mountains and Hay Bluff can be seen to the South with 'Kilvert' Country and Clyro to the North. Ideal for School groups and Stag Parties Hay-on-Wye, about two hours canoeing down stream is famous for its second-hand bookshops. Holiday makers come from all over the world to the Book capital of Britain and now everywhere you look bookshops, printshops and antique dealers make this a great place to finish your canoe trip. Talgarth, Brecon and Crickhowell welcome you into the Brecon Beacons National Park to the South & West while Hereford and its cathedral are near to the East. Wye Valley Canoe Centre has a large fleet of first class Canadian Canoes for two to three people plus a selection of single & double Kayaks. 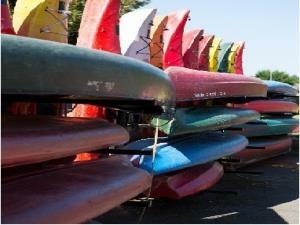 Canoe Hire and/or instruction is available. All canoes come with paddles, buoyancy aids and helmets. Spray decks and skegs are available for the kayaks if required. We offer exciting long haul trips down the river Wye. These multi-day expeditions allow you to see stretches of the river not normally used by other canoeists. Overnight accommodation can be taken in hotels, guest houses or simply camping by the riverside in undisturbed country settings. Two Day trips to longer journeys can all be arranged. You may start from Glasbury and the highlights might include the beauty spot of Symonds Yat with its rare Peregrine Falcons, or on to historic Monmouth and eventually past Tintern Abbey to Chepstow and its castle. These extended Canadian canoe trips are ideal for family and friends to enjoy river life and relax as you paddle downstream. The Centre itself is ideally placed just metres East of the river bridge in Glasbury offering its own launch facilities as well as changing room with showers, toilets etc. There is also a minibus available to collect you after your trip downriver and return you to your car. Our small team of well qualified instructors can offer you courses in both Canadian and Kayaks from novice to aspiring expert.